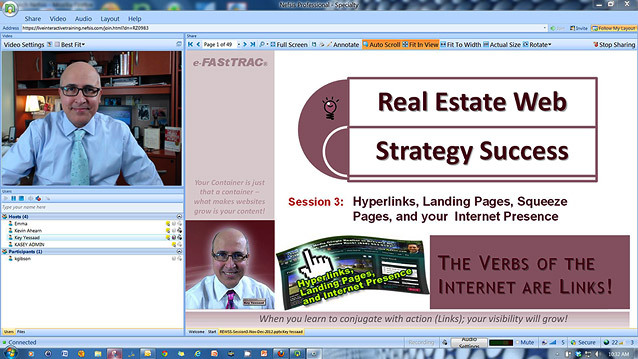 Today is Session 3 of my Series Real Estate Web Strategy Success; I will be focusing on three concepts: 1. The Verbs of the Internet, also known as Hyperlinks; 2. The concept and creation of Dynamic Landing Pages; and finally 3.Squeeze Pages and their importance in generating new leads. Real Estate Agents and Brokers must learn to go beyond getting a Website, putting some lipstick on it (CSS) and hoping for the best; Our Agents and Brokers need to develop Web Strategies that generate Organic Traffic but that are also sticky. Your Website needs to become your ally when you are prospecting; it needs to help you bridge the gap between your outbound Marketing and help it generate organic Inbound Marketing. Look forward to visiting with all of you today!